It’s time to study and you need something to help you focus on what really matters this semester. The free Study Timetable Organizer is the ultimate tool to knuckle down and prepare yourself for the next test or quiz. This free document is a simple schedule that’s designed to help you write the items you need to know for a test and set aside time to study. 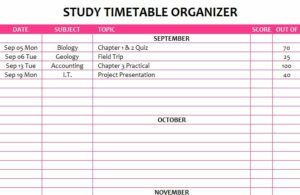 Many people struggle to organize dedicated time for study but with this template, you simply can’t fail. If you’re ready to get started today, just follow the set of instructions below. To download the free Study Timetable Organizer, just follow the link at the bottom of this page. Next, go to the “List data” tab to start entering your different subjects of study. This will make it easier for you when you enter this data into the main table, on the other page. You can use the simple drop-down menus to select these subjects as well. When you finish entering your subjects, start by going to the “Study Schedule” tab. This is where the magic truly happens. You’ll use this simple template to start organizing your schedule. Begin by entering the date of your scheduled exam in the first column of the template. The next column is where you’ll apply your drop-down subject items. Under the “Topic” section, be as specific as possible about what your exam details. You want to give yourself enough information to work with when you finally sit down to study. Finally, you can enter what grade you received from the test, when you get those results back. This way, you can be sure to study even harder next time if you didn’t get the results you wanted.